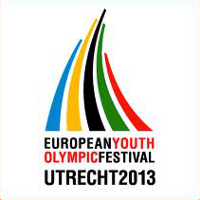 From 14 to 19 July the European Youth Olympic Festival will take place in the Dutch city of Utrecht. 3,300 young athletes between 13 and 18 years of age from 49 European countries are expected to participate, and handball is one of the nine sports they will compete in. Players born in 1996 or 1997 will participate in the handball competition which will be held among eight teams each in the women's and men's event. In the men's event Sweden, Austria, Belarus and Netherlands play in group A, while Germany, Slovenia, Croatia and Norway have been seeded in group B. For the men's event the EYOF is also the qualification tournament for the 2014 Youth Olympic Games in Nanjing (16 to 28 August). In the women's event Norway, Czech Republic, Germany and Netherlands make up group A. Russia, Denmark, Sweden and Hungary are placed in group B. There will be a live stream available. Full statistics from the event are available via the eurohandball.com ticker. In the semi-finals of both competitions, the first ranked team of Group A will face the second ranked team of Group B and vice versa. The overall match schedule is available here (men) and here (women) and can also be downloaded here (pdf format).